The Trump administration is expected to permit Iran to remain connected to the international banking system, a major concession to European allies who have been pressuring senior U.S. officials to keep this key lifeline to the Islamic Republic open, according to U.S. officials familiar with the situation. The United States is set to allow Iran to remain connected to the SWIFT banking system, an international monetary consortium that facilities cross-border transactions, according to sources familiar with ongoing talks between top U.S. officials and European allies who have been pressuring the Trump administration to take a softer line on Tehran ahead of the Nov. 4 implementation of new sanctions on Iran. The move is being met with frustration by Iran hawks on Capitol Hill and elsewhere who have argued that SWIFT continues to provide Iran with a critical financial lifeline as the country continues to fund terrorist operations across the region despite its ailing economy. In the past months, as European allies pressured the Trump administration to take a softer line with Iran, SWIFT has emerged as a key sticking point. While the Trump administration had vowed to choke off Iran's financial routes, senior officials appear to have softened that stance in the face of European pressure. U.S. officials familiar with the state of play on these negotiations told the Washington Free Beacon that Iran will remain connected to the SWIFT system, despite opposition by Iran hawks in the administration and in Congress. The internal battle over Iran's access to SWIFT has been brewing for months and is likely to remain at the forefront ahead of the implementation of new sanctions next month due to opposition by the Israelis and others who aim to see Iran completely iced out of the international banking system. "The Europeans are clowning the Americans," said one source familiar with the recent discussions between American and foreign officials. 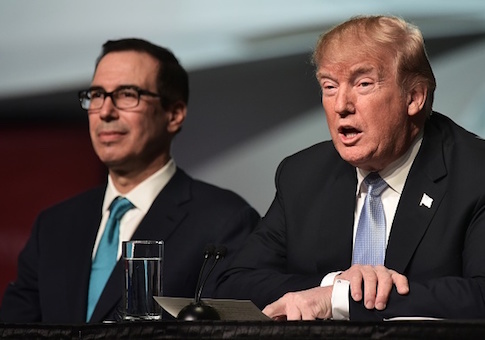 "They sold [Treasury Secretary Steve] Mnuchin on this idea that keeping Iran on SWIFT will generate intelligence—the word they keep using is ‘leads'—and Mnuchin is now echoing Obama talking points about how sanctioning some banks is enough." "He's making Trump into Obama," said the source, who would only discuss the sensitive issue on background. "Meanwhile the Europeans and Iranians are publicly gloating because they know that as long as Iran stays on SWIFT they can wait out Trump." The Trump administration has been under pressure for months from European allies to keep Iran connected to SWIFT, despite fierce opposition to the move among some inside the administration and many legislative allies on Capitol Hill. The latest concession on SWIFT by the Trump administration has sparked criticism among some who say the current administration is becoming similar to its predecessor, the Obama administration, which worked to defang sanctions and open up Iran's economy to the globe in spite of its global terrorism operations in regional hotspots such as Syria, Yemen, and elsewhere. Treasury Secretary Mnuchin said in recent remarks the administration is working to prevent sanctioned transactions from taking place via SWIFT. "I can assure you our objective is to make sure that sanctioned transactions do not occur whether it’s through SWIFT or any other mechanism," he told Reuters. "Our focus is to make sure that the sanctions are enforced." While Mnuchin would not offer details on the nature of U.S. talks with SWIFT leaders, he vowed the administration would "quickly" identify banks that can continue conducting transactions under the rubric of humanitarian aid to Iran. "We want to get to the right outcome, which is cutting off transactions," Mnuchin said. A Treasury Department spokesman told the Free Beacon the administration will closely police the body's activities to ensure that no sanctioned Iranian entities can use it. "Secretary Mnuchin has led an intense economic pressure campaign against Iran as part of this administration's comprehensive strategy to address the totality of Iran's malign and destabilizing activity, with much more to come," said the official. "Treasury has made it very clear that we will continue to cut off bad Iranian actors, including designated banks, from accessing the international financial system in a number of different ways," the official explained. "We will also take action against those attempting to conduct prohibited transactions with sanctioned Iranian entities regardless of the mechanisms used." However, the administration "will not comment specifically on any future sanctions on SWIFT or other entities," the official said. The latest statement from Mnuchin and other Treasury Department officials has not assuaged fears. Mark Dubowitz, a sanctions expert and chief executive of the Foundation for Defense of Democracies, which has pushed hard for crippling sanctions on Iran, told the Free Beacon that Iran must be fully iced out from SWIFT, as was done with North Korea recently as a result of its rogue nuclear program. Other sources familiar with the state of play expressed frustration and accused the Trump administration of taking a weak approach, despite its tough rhetoric on Iran and its terrorist funding streams. "John Kerry is holding a candlelight vigil tonight praying Donald Trump doesn't kick Iran off SWIFT," said one veteran foreign policy hand involved in the issue. "That's the only way his plan to keep the Iran deal alive succeeds. Trump will have proven weaker than Obama on sanctions and he will have caved on his maximum pressure strategy before it even started." This entry was posted in National Security and tagged Iran, Sanctions, Steven Mnuchin, Trump Administration. Bookmark the permalink.